I recently opened a blaster of Upper Deck Icons Football, and found a surprise. No not an auto, or printing plate or stunning patch. No instead I found this . . . .
. . . . which left me scratching my head. Having had broken and reviewed a hobby box of this product back in July, I was very confused to say the least. A quick search on eBay revealed several packs and lots of singles. 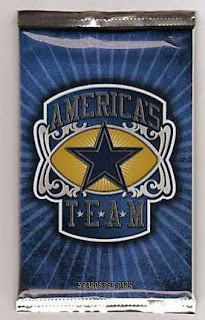 Now even more confused, I went to Upper Deck's website and found that America's Team has its own product page. At this point I'm really, really confused. I mean, I'm usually pretty on top of product releases and what not. So I figure I blew it and missed a product release, only one problem. I can't find a Hobby box on eBay, Dave and Adam's, or Blowout Cards. Say what you want, but if these three places don't have it, it doesn't exist right? Needless to say, I will be shooting an email to Greg Kohn, one of Upper Deck's brand managers for football to try and get the 411. A closer look at the product breakdown reveals a very nice 100-card base set, with the inserts dominated by autographs over relics at a rate of almost 4:1 (9 memorabilia subjects, 39 autograph subjects). 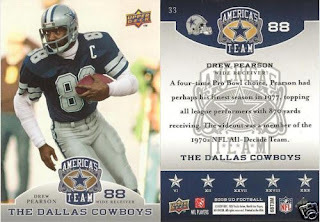 Memorabilia cards include Troy Aikmen, Roger Staubach, Emmitt Smith, Tony Romo, T.O., and more. The autograph line-up is heavy, with autos of legendary greats like Dan Reeves, Randy White, Everson Walls, Ed Jones, Staubach, Aikmen, Emmitt Smith, Billy Joe Dupree, Jimmie Johnson, Jay Novacek and Daryl Johnston to name a few. More info as it becomes available. However, if you know something I don't, fill me in. Being a Cowboys fan, I asked about this product at UD booth during the National. I guess (and I'm not the expert others are on this) they are only selling it through the retail channels. You can get the boxes at Target, Walmart, etc. But Blowout, D&A, etc won't carry it. I even asked D&A at the National about it - they hadn't heard of it at the time.